Ice types: Cube, flaked or Nuggets? Commercial Ice Types, what to choose?? 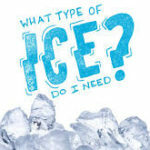 Ice type is one of the top three decisions one must make when deciding upon a commercial ice machine. The four main categories that we like to divide the types into are cube, flake, nugget and gourmet.